Hi my name is Jane Wilkinson. I was originally drawn to working with willow out of a love for trees and woodlands and also from a desire to do something sustainable. Basketry was the perfect solution. I now grow and harvest an increasing proportion of my own willow, and then have the pleasure of weaving it into a basket or sculptural piece. I have been weaving for 17 years and am constantly learning new techniques which have been used to make a range of traditional baskets. During this time I have travelled in Scotland, Ireland, England, and New Zealand, where I have worked with the local crafts people and discovered a great diversity of style and approach. In my current work I feel challenged to preserve, continue and develop the traditional techniques which I have mastered, whilst being inspired to incorporate them into new and innovative designs. 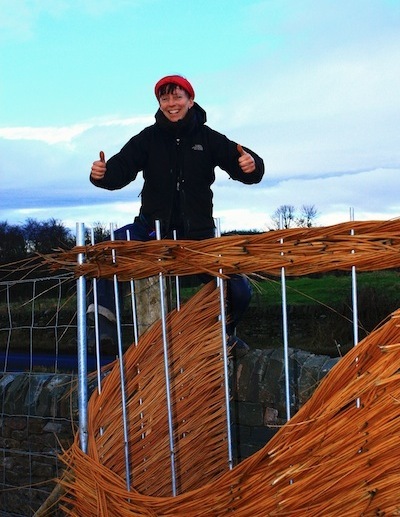 1996 - 2014 Teaching basketry, hurdle & coracle classes throughout Scotland. 2013 Travellers' Bough Tent; willow sculpture for Stories in the Land Exhibition, Scottish Storytelling Centre, Edinburgh. 2013 Woven panels for the Hebridean Drying Barn, an archeological reconstruction project for the Applecross Landscape Project, Inverness-shire. 2013 Artist in Residence for Blairgowrie High School decorated coracle project. 2013 100 foot long Willow Entrance Fence at a new cemetery in Drumsturdy Road, Dundee, for Dundee City Council. 2010 Artist in residence for 'Metamorphosis' an art project run by the Arts Development Group, Meigle Primary School, Perth & Kinross Council. 2007 - 2009 Short courses for the Forest Education Initiative, training adults in forest education activities. 2009 Woven bird hide screens for the Wildlife Garden at Inchture Primary School. 2009 Woven willow screens with Training For Work Employees at Arbroath, Angus. 2009 Open studios, basketry exhibition, Kirkmichael Perthshire. 2009 The Big Fish, willow and fabric sculpture for Alyth Start Festival. 2009 300 foot long sculptural willow screens delineating desire lines on Broughty Ferry Beach for Dundee City Council. 2007 Forest School Level 3 Practitioner's Award gained. 2007 Decorative willow panels made with Fife primary school children for the entrance of the Big Tent Festival of Stewardship, Falkland, Fife. 2007 Woven willow panels for the wildlife garden at Coupar Angus Primary School. 2007 Decorative willow fence for the Butterfly Garden at Alyth Primary School. 2007 150 ft long decorative willow fence, Baxter Park, Dundee. 2006 Living willow sculpture, Straloch Primary school, Perthshire. 2006 Decorative willow screens, Sandmartin nesting bank project, Broughty Ferry Environment Project , Dundee. 2005 - 2007 Education work with primary schools for the touring "Woodland Bus", Forestry Commission @ Countryside Trust, Perthshire. 2005 Tutor for the Scottish Basketmakers' Circle AGM and Forest Education Initiative Schemes. 2005 200 foot long willow screen, Camperdown Park. Dundee City Council. 2005 Invited artist at the Pittenweem Arts Festival, exhibiting contemporary baskets. 2005 Reconstruction of Spey Curragh for Elgin Museum and coracles for Port Soy Boat Festival. 2005 Decorative screens and willow puppets for "River of Words" Project, Royal School of Dunkeld, Perthshire. 2005 Presentation for Applied Art Scotland, Edinburgh College of Art. 2004 Willow fire sculpture and woven panels, community art project, Art in Kinross, Perthshire Arts Council. 2004 Basketry & garden structures tutor for Royal Botanical Gardens, Edinburgh. 2004 Decorative willow screens for Breadalbane Academy, Aberfeldy. 2004 Large sculptural "Boat Seat", Broughty Ferry Environment Project, Dundee. 2003 Living willow sculptures, Grounds For Learning Project, Perthshire. 2003 In-service teacher training, living willow sculptures and basketry classes, Orkney Education Department. 2003 Decorative willow screens and weaving classes, Silvery Threads Project, Broughty Ferry, Dundee. 2003 Living willow domes, Fife Education Department. 2002 - 2003 Working with the Fife Museum and Arts Bus project, Kirkcaldy Museum. 2002 'Plantweave Exhibition', baskets and willow hut installation for Royal Botanical Gardens, Edinburgh. 2001 Woven barriers for RSPB nature reserve, Vane Farm, Kinross, Fife. 2001 Exhibition installation, woven screens for 'Return of the Natives' , Royal Botanic Gardens, Edinburgh. 2001 Willow mural, for the Broughty Ferry Environment Project, Dundee. 2000 'Celebrating Scotlands' Crafts', traditional basketry exhibition at the Royal Museum of Scotland, Edinburgh. 2000 'New Work' solo exhibitionfor the Royal Botanic Garden Exhibition Hall, Edinburgh. 1999	'Reflections', exhibition at The Pittenweem Arts Festival, Fife. 1997	'Woven Images', exhibition at the Gracefield Arts Centre, Dumfries. 1996 - 1999	Teaching adult education classes for Fife Council. 1996	Kilmartin House, Argyll - commissions for museum collection.